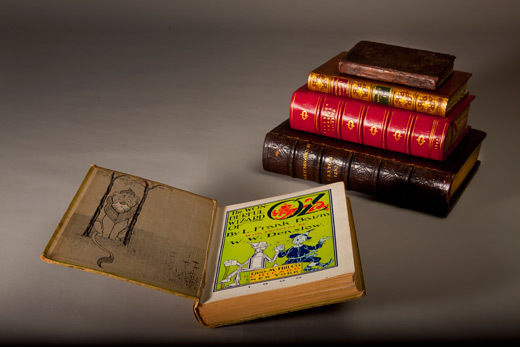 An assortment of rare books valued at more than $1 million has been donated to Emory's Manuscript, Archives, and Rare Book Library (MARBL). The 22-title collection, which includes one of the first books printed in the English language, was given by Ohio book collector and business leader Stuart Rose, an Emory alumnus. "These extraordinary books will, without a doubt, enhance the prestige and scope of Emory's collections," says Rick Luce, provost and director of Emory Libraries. "Mr. Rose's generosity and his dedication to strengthening MARBL are deeply appreciated." The Rose gift includes in its original binding a first edition of "Poems," the first book published by English Romantic poet John Keats; a theological study by St. Thomas Aquinas that is now MARBL's oldest book; and a 15th century volume of universal history, the "Polychronicon," one of the first books published in the English language. Among the other books in the collection are rare editions of works by Emily Brontë, Rudyard Kipling, Giacomo Casanova, L. Frank Baum, Victor Hugo, John Maynard Keynes and Charles Dickens. Rose's 1653 first edition of Izaak Walton's "The Compleat Angler" is held by fewer than 20 libraries in the United States. Rose, a 1976 graduate of Goizueta Business School and a longtime MARBL patron and friend, is chairman and chief executive officer of REX American Resources Corp., a large public alternative energy company in Dayton, Ohio. In the last two decades he has built a remarkable rare book collection, including a signed presentation copy of a first edition of Charles Darwin's "On the Origin of Species," which he loaned to Emory for a special exhibition in 2009. Spanning more than 800 years of human history, the holdings of Emory's MARBL have particular strengths in literature and the arts, African American history and culture, religious expression and the freedom struggle. MARBL is one of North America's major literary archives. Rose's gift to the library is part of Campaign Emory, a $1.6 billion fundraising endeavor that combines private support and Emory's people, places and programs to make a powerful contribution to the world. Investments through Campaign Emory fuel efforts to address fundamental challenges: transforming health and healing, gaining ground in science and technology, resolving conflict, harnessing the power of the arts, and educating the heart and mind.